Submarine Prop Kit Set (PN DCCF-SUB) contains SUB Training Flag Kit (PN DCCF-SUB01), SUB Training Light Kit (DCCF-SUB02), SUB Monitor Kit (PN DCCF-SUB03), and SUB Miscellaneous Kit (PN DCCF-SUB04). 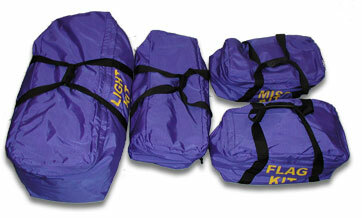 All four prop kit bags. For a complete inventory see below.